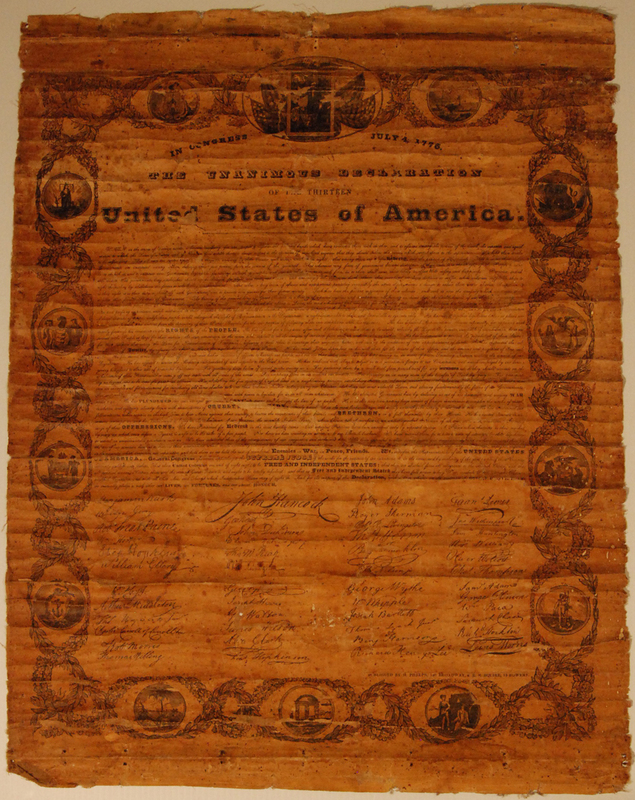 This is a circa 1830’s printing of the “Unanimous Declaration of the Thirteen United States of America” published by Humphrey Phelps and Bela S. Squire, Jr. of New York City. This varnish-coated paper document backed with cotton gauze originally would have been mounted between two wooden dowel rods like a scroll. It would have hung in a classroom, a public building or maybe a place of business. 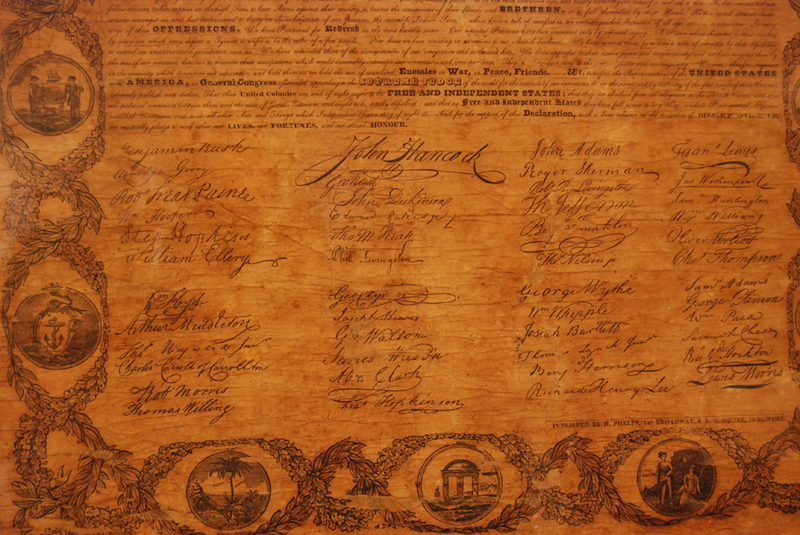 This piece does not appear to be a common example of Phelps’ & Bela’s printings of the Declaration from this period. 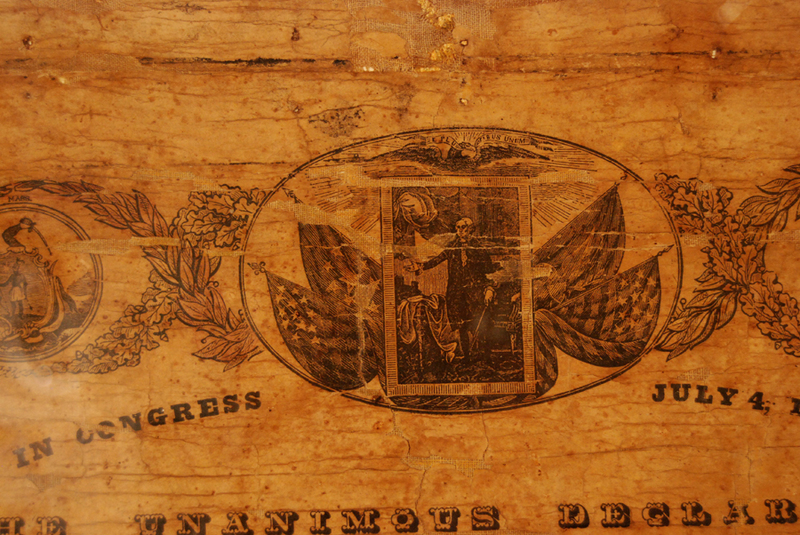 It features the Lansdowne portrait of George Washington at the top in addition to the seals of the thirteen original states. The laurel and oak leaf roping around the edges on this version have been hand colored with red watercolor. 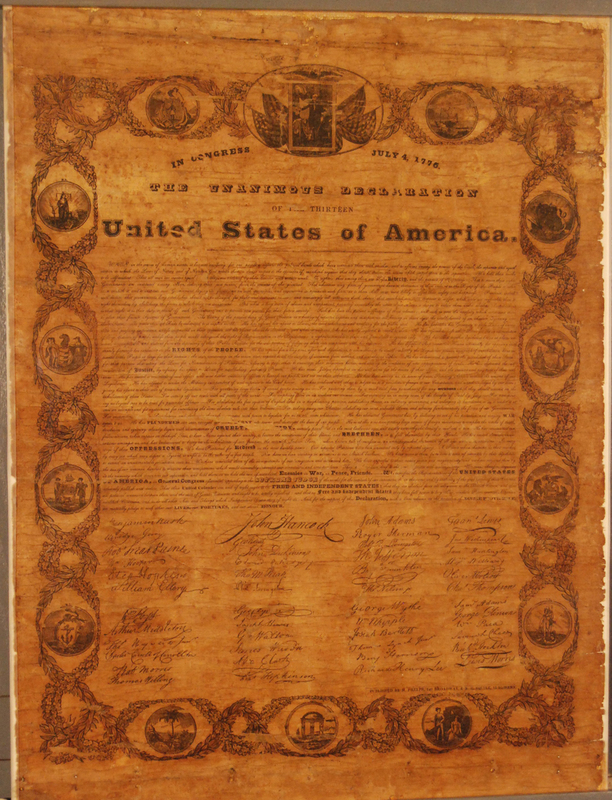 This edition of the Unanimous Declaration measures 27 ½”h x 21 ½”w. It is printed in black ink on machine made wood pulp paper and was attached to fine linen gauze with starch-based paste. The hand applied red watercolor wash on the oak leaf and laurel roping has faded and is barely visible in some areas around the edges. The varnish coating, originally added to protect the piece while on display, is now extremely yellowed and stiff. The piece had been rolled at some point following the removal of its scroll bars. The artifact had been flattened while rolled and as a result, the paper and varnish had cracked predominantly in the horizontal direction. Isolated losses of paper have occurred where it had delaminated from the gauze support. The edges of the document were frayed and there were numerous fly droppings over the entire front surface of the document. Because of the acidity of the droppings, many had irrevocably damaged the surface of the paper. Water staining was noticeable on the artifact along the bottom edges as were several white splatters of oil-based wall paint throughout. There were evenly spaced, vertically paired sets of holes in the document along the top and bottom edges from where it originally would have been folded back on itself and attached to hanging poles. 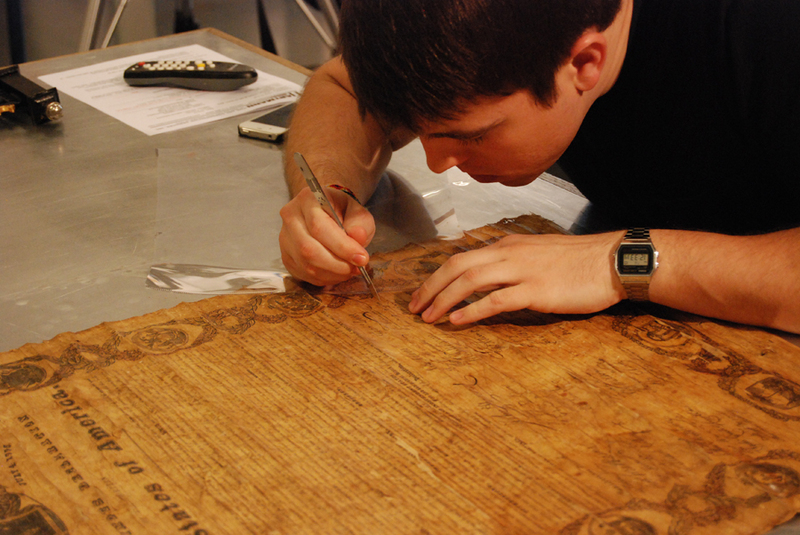 The top three to four inches of the surface of the document had oily staining and was somewhat darker than the rest of the piece from being handled while being rolled. The artifact was documented with a written report and digital photography, before, during and after treatment. The surface of the piece was first cleaned with crumbled eraser to remove the bulk of the surface grime and dirt. The discolored varnish coating was carefully removed from the surface of the paper with organic solvents. It was amazing to see how much more supple and strong the once brittle paper was after the varnish coating had been removed. The red color wash on the decorative roping was not affected, and in fact appeared to have retained much more of its coloration than originally was thought to have survived. Fly droppings were painstakingly removed with a surgical scalpel using magnification from a head loop. Hundreds and hundreds of these small black round dots were removed. Flies appear to be attracted to the oils or resins in the varnish coating and this same phenomenon occurs on many varnished works of art. Once the varnish, grime and dirt layers were removed from the document, the back side was misted lightly with deionized water and placed between acid-free white blotter paper under weights until dry and flat. A coating of wheat starch paste was brushed onto the back of the piece and it was placed again between blotters with weight until dry. This coating of adhesive firmly bonded the cracked, delaminating paper to the linen gauze substrate. 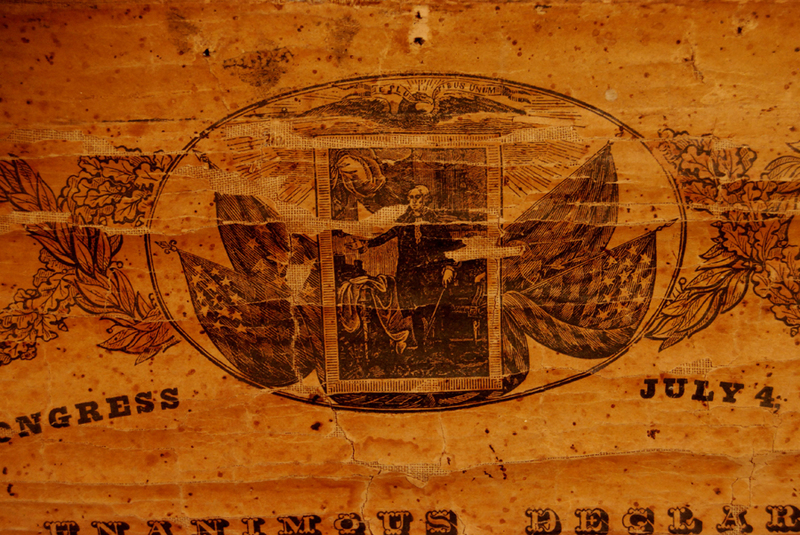 Major losses in the paper support were in-filled with historic paper of a similar texture, thickness and color. They were fit to size and attached with wheat starch paste. Visually disturbing losses of black borders, large block lettering and some areas of images were toned in with colored pencils. The piece was backed with a cream colored acid-free matt board. Some areas where paper and gauze had been missing were toned just on the matt board backing (not on an insert) with colored pencils and pastels. A sealed archival package for this piece was created using ultra violet filtering clear acrylic sheeting, acid-free matt boards, and Coroplast corrugated board. The edges of the package were sealed with archival tape on a Mylar carrier. This artifact was placed into a new frame, and was secured with brass mending plates, braided picture wire and “D” ring hangers.